To ensure the establishment of safe and secure society, we must address current environmental concerns regarding chemical contamination and ensure that major environmental pollution events, such as the outbreak of Minamata disease in Japan, do not happen again. This is the basis of establishment of all other sustainable goals of low-carbon society, sound recycle-oriented society or society in harmony with nature. The aim of this research program is to provide scientific support through development of new findings on hazard, analytical technologies, fate processes and models, and abatement technologies, and also advanced risk assessment methodologies and management framework for environmental chemicals. To achieve this aim, the program is using a multi-faceted, systematic approach to find out new insight of health and environmental hazards, develop methods for assessing health and environmental risks, and abatement technologies to the risks, posed by environmental chemicals. The program is examining the effects of chemicals on higher-order biological functions and multi/transgenerational impacts, developing new systems for assessing the ecological impacts of chemical bioaccumulation and advanced high-throughput chemical analyses to obtain a more comprehensive understanding of the dynamics of environmental chemicals. In addition, the project is examining the atmospheric processes and the adverse health effects associated with exposure to PM2.5 and other air pollutants, and developing advanced methods for the conservation of regional aquatic environments. Project 1 is assessing the health effects of chemicals in children and future generations, and is examining the effects of chemicals on the development of immune and metabolic diseases, developmental neurotoxicity, and multi/transgenerational epigenetic inheritance. Project 2 is developing comprehensive environmental monitoring methods and networks, and is developing multicomponent simultaneous analysis and non-targeted analysis methodologies for the detection of biological effects and elucidating the potential chemical contaminants. Project 3 is developing ecological risk assessment and management based on ecological models, and is developing models to elucidate the causal relationships between environmental disturbances and ecological communities to predict environmental disturbances within ecosystems. 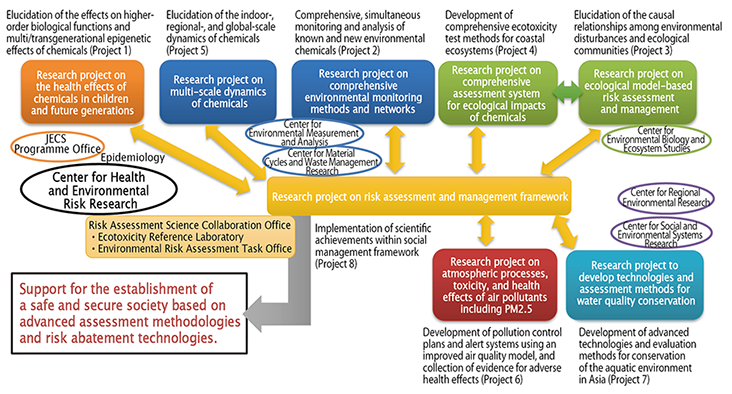 Project 4 is developing a system for the comprehensive assessment of the ecological impacts of environmental chemicals, and is developing advanced methodologies for determining the ecotoxicity of environmental chemicals, assessing the integrity of coastal ecosystems, and determining the effects of mixtures of chemicals on the environment. Project 5 is examining the dynamics of chemicals on several spatio-temporal scales by developing analytical techniques and global-scale models for investigating the movement of toxic heavy metals through the environment, by examining the emission and behavior of chemicals on the regional scale, and by examining the dynamics of chemicals on the indoor scale. Project 6 is examining the atmospheric processes, toxicity and health effects of air pollutants including PM2.5 to propose pollution control plans, to collect evidence of adverse health effects and to construct alert systems. Project 7 is developing improvement technologies and assessment methods of water quality for the conservation of aquatic environments. Project 8 is developing an advanced risk assessment and management framework, and is developing a novel framework for assessing and managing the risks posed by environmental chemicals through interdisciplinary discussions on strategies and social actions. By combining the research outcomes of these eight projects, the program aims to establish advanced systems for the detection and assessment of the health and environmental risks posed by known and new environmental chemicals for which there is currently no established approach, as well as to develop comprehensive and rapid monitoring and prediction systems and management technologies for environmental chemicals.